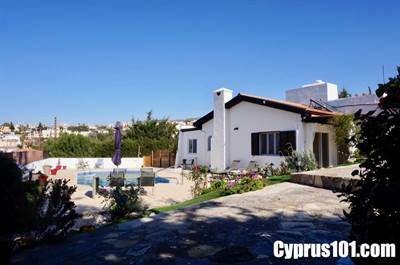 This immaculately presented three bedroom detached bungalow with additional study/guest room, is idyllically situated in a popular residential neighbourhood of Tala, within easy reach of Paphos, the coast and the International School. Tala has a wonderful variety of local amenities including shops & local businesses, a recently renovated traditional village square with bars and restaurants and an amphitheatre which holds a range of musical and theatrical events throughout the year. The property has been lovingly cared for by the current owners who have made significant improvements using quality materials and finishes, whilst at the same time maintaining its intrinsic charm and character. The accommodation features a bright entrance hallway with study/guest room to the left. Straight ahead is a light and spacious living room with wonderfully high, wood beamed ceilings, useful built-in storage and superb timed/temperature controlled, pellet burning stove. Through a decorative archway is a formal dining room with doorway to the family size kitchen/breakfast room and separate utility room. There is easy direct access from both the dining room and breakfast area to a super, fully enclosed and partially decked outdoor terrace. Off the living room is an inner hallway leading to three double size bedrooms and a family size bathroom. The master bedroom features a walk in closet/dressing room and spacious en-suite shower room with stylish glass brick features and marble topped vanity unit. Moving to the outside, the property is south facing and therefore benefits from having sun throughout the whole day. Being situated on a 938 sqm plot, there are plenty of leisure areas to enjoy, including a large sunbathing terrace with newly lined, crystal clear swimming pool and BBQ/outdoor dining space. From an elevated terrace to the side there are gorgeous views of the coast and surrounding village. The garden is fully enclosed and well stocked with a variety of fruit trees including almond, lemon, orange and plum, plus a multitude of vibrant shrubs and bushes. At the entrance is a gated driveway with covered car port and opening parking space. With sunshine all day, this property is certainly a perfect option for those seeking a permanent residence or holiday home on a sizeable plot, in excellent condition with no updating or refurbishment necessary. There are full title deeds.